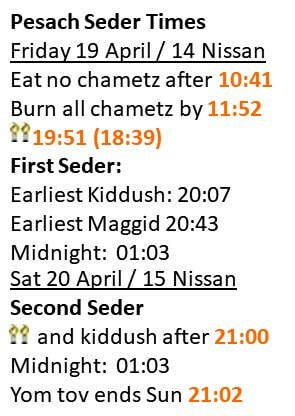 Pesach this year starts on Friday night 19 April. No Jew should lack a place for a seder. Please contact us (scroll down for a form) and we will welcome you and promise you an enjoyable evening of conversation, song, and good food. In addition to the seders, for children we have several weeks of activities planned to prepare for the big night, as well as a matzah picnic and special child-centred service planned for the last day of Pesach. Email us to join the fun! Kosher for Passover food is available for delivery from http://www.justkosher.co.uk/ who will deliver on Sunday and Monday 14 and 15 March. Book your delivery well in advance. Many items are also available from www.ocado.com though care should be taken to make sure items are kosher for Passover and not just for year-round use as this is not a specifically kosher site. Our online chametz form makes this easy for you. If you need a place for a seder or advice on obtaining Pesach food, please let us know!